Whenever one travels through Central or South America they tend to follow the ‘Gringo Trail,’ a popular route that western people tend to use to make their way around a country or continent. Whilst you become pretty familiar with this route once you are in the country (by asking fellow travelers) I find it almost impossible to find these routes via the internet. I have decided to create a blog post for each country in Latin America of the common Gringo trails, so that you are able to research and plan your desired destinations ahead of time. First up in the series is Colombia. ‘You’re going to Colombia? But you’ll get killed!’ Is the common response you get when you tell people that you are going to Colombia. Colombia is remembered from media stories of the past about guerrillas, drug lords and murders on the streets. Whilst this was very accurate in the past Colombia has changed a lot and it is begging for tourists to make their way to this beautiful country. These days it is known by travelers as the country at the northern tip of South America with lush rainforests, towering mountains, coffee plantations and Carribean beaches… and you’re going to love it! Bogota is Colombias sprawling, high altitude capital with a population of over 13 million people. 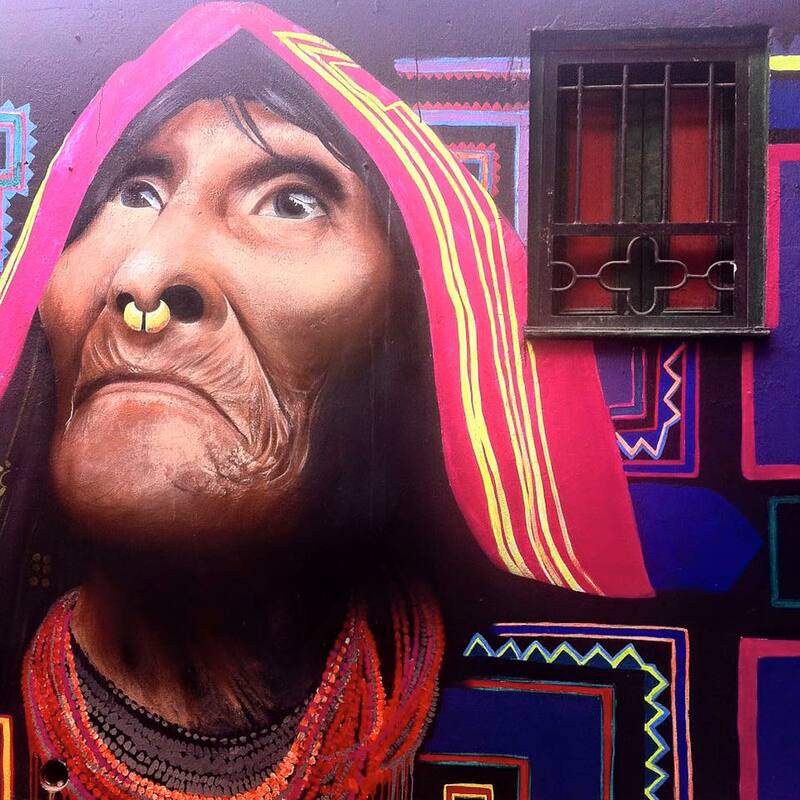 This city is most known among travelers for it’s amazing street art. Be sure to check out the free Graffiti Walking Tour, it was the highlight of our trip. Sitting at 8,600 feet above sea level the temperatures can change drastically, so be prepared. Click here, to see my previous post about this awesome city and for more information on things to see and do! Medellin is the second largest city in Colombia and far more contemporary than I was imagining. Medellin was nothing like Bogota and reminded me of Buenos Aires in many ways. Sitting in a valley of mountains it is also quite beautiful to look at from above. 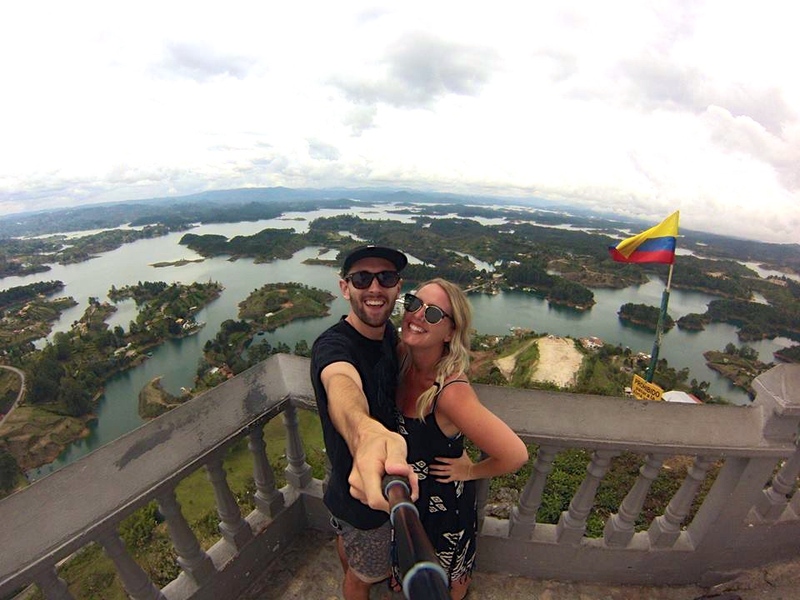 The most popular things to do from here is the free city walking tour (be sure to book two days in advance via the website, it is very popular) and a day trip to Guatape, one of the countries largest (man-made) lakes. In order to see the amazing views from the top of the rock, also known as La Piedra, you will have to climb 733 steep steps. It is hard work but the view is totally worth the pain. Where to stay: Happy Buddha is very popular but is a big party hostel and the music will be pumping all night long. We also stayed at Geo Hostel down the road which was much quieter and super clean. This real-life cowboy town was one of our highlights in Colombia. If you want to get out of the cities and relax in the mountains this is the place to go. 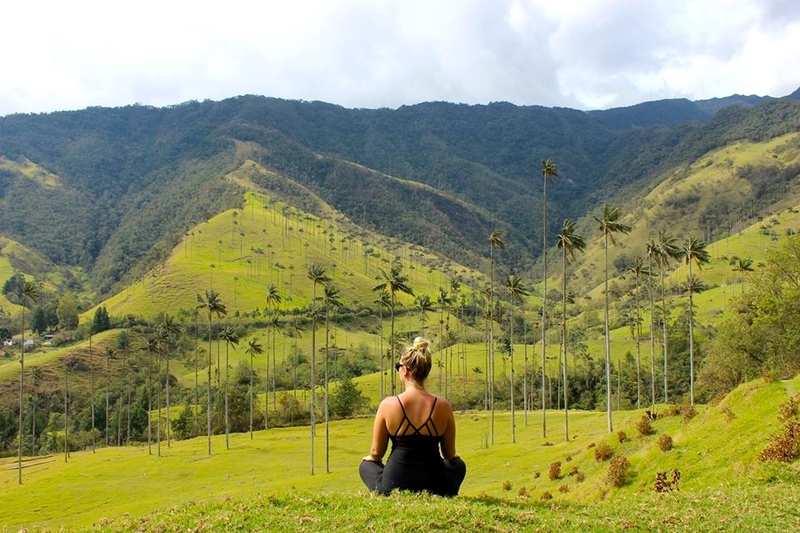 The highlight here is beautiful Cocora Valley, which boasts the worlds tallest Palm Trees. Click here for more of my tips and suggestions on this amazing little town. When we were discussing our plans to travel Colombia with friends we were told over and over again to visit this national park, most loved by Gringos for the fact you can sleep in hammocks on the beach for a few days of rest and relaxation. Click here to read more about how to get to this gringo favourite. This little mountain town is one of the most beautiful places I have ever stayed during my time in South America. 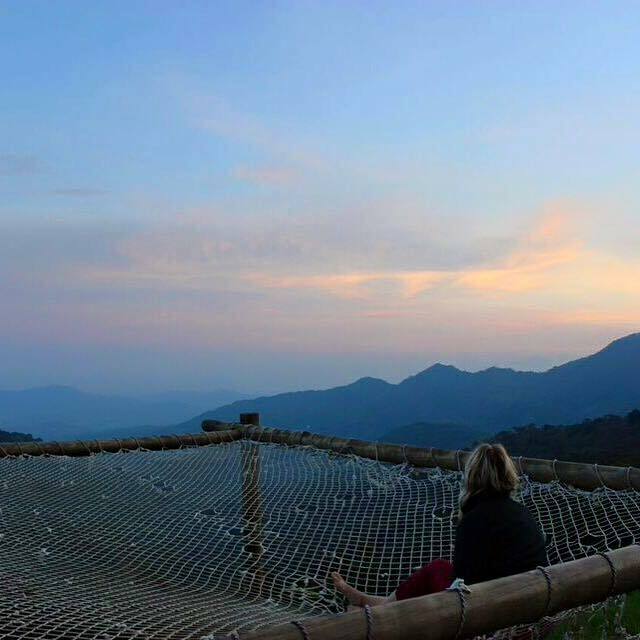 With mountain views, wildlife, waterfalls and the largest hammock in the world this place is a backpackers dream. Click here for more tips on this paradise. 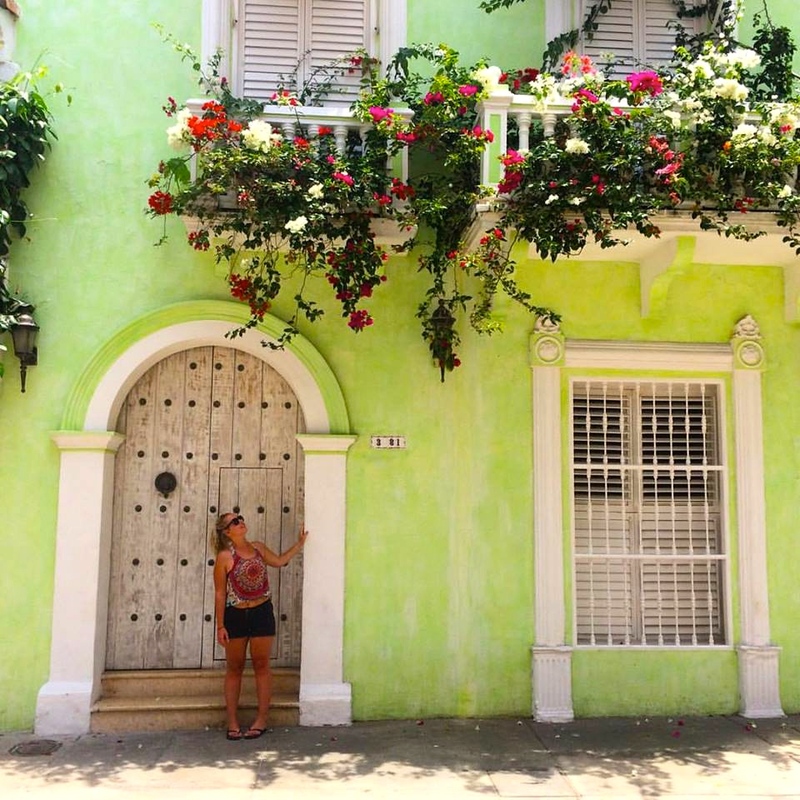 When I think of the Carribean I think of seafood, fresh fruit, reggae music, women dressed in colourful clothing, beautiful beaches and colourful buildings and that is exactly what Cartagena is. Cartagena was my favourite stop in Colombia, so different from everywhere else. The walled Old Town, a UNESCO world heritage site, is filled with cobblestone streets, colourful colonial buildings and 16th century plazas. It is something from a fairy-tale and the only place you should consider staying. Cartagena has amazing restaurants, but you will pay a much higher price to eat here. The top things to do here is visit Playa Blanca, the Rosario Islands and the Mud Volcano but my favourite thing of all was just walking around the beautiful streets and admiring the gorgeous buildings. Be sure to check out Gelataria Tramonti, an amazing and authentic Italian Gelato store. All the ice cream is made in store with fresh ingredients and it is so delicious I returned everyday for four days. My favourite flavours was the dairy free chocolate, the salted caramel and the mojito. Amazing! My mouth is watering just thinking about it. Other notable mentions include Cali, Palomino, Rancho Relaxo & Casteno Beach Hostels. Here is a little map so you can visualise where each town is and plan your trip accordingly. It is super easy to catch buses in Colombia but we found that it was often the same price to catch a thirty minute flight as a 16 hour bus ride. Be sure to research this, it could save you hours of sitting around on windy bus rides! There you have it, these are the top places on the gringo trail for Colombia, note that the gringo trail doesn’t include places off the beaten path. This country is becoming very popular very fast with travelers so be sure to get there soon before tourism changes it too much. I hope this helps you plan your epic adventures. Over to you… Which of these places would you most like to visit? Or, what other places do you recommend visiting on the Colombian Gringo Trail? 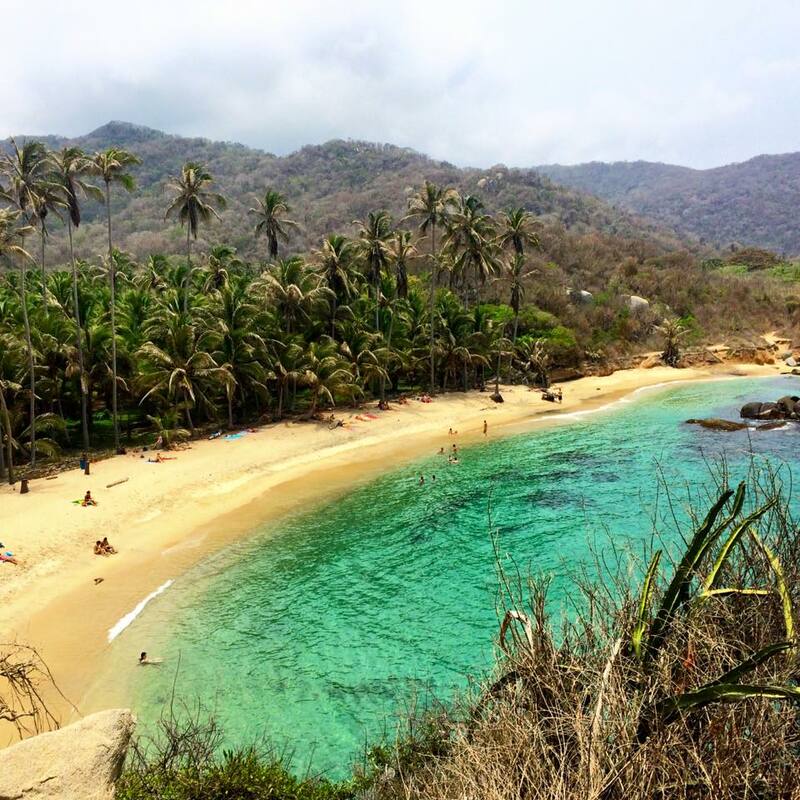 A Guide to Taganga & Tayrona National Park! Además, !he compartido tu sitio en mis redes sociales! Hey really nice article! I’m visinting South America and now Colombia with my boyfriend and we actually have been to all this gringos place haha! worth it (even if unforteanlly we don’t have time to go to Pacific). Travelers who are reading this and have time you should defenitly check on those place too! Still… there are no big enough article to talk about Colombia ! Hey, enjoying reading your blog! I noticed you said to store luggage a few times at Santa Marta and Taganga. Can you tell me the names of the hotel/hostel you stored them at in these towns?? Hi, Most hotels and hostels do luggage storage if you ask, particularly in places where going on tours etc for a few days is common. I’ve never been refused luggage storage. Hey Sasha! Thanks heaps for your articles, my sister & I have found them super helpful on our trip! 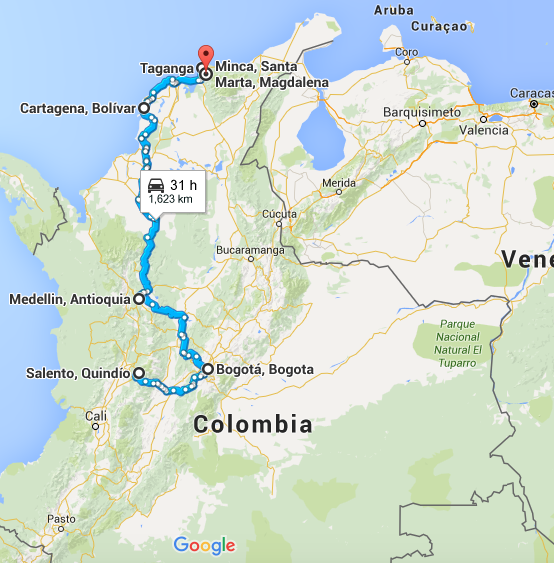 We followed a similar path in Colombia except we went to San Gil instead of Salento (previous comment by Tabby is spot on – heaps of action packed activities for cheap!) Loved each place, particularly Cartagena and Medellin. We stayed at Casa Elements in Minca which was amazing but they did lose our booking despite us confirming it twice. This also happened to a few other guests so I would recommend people triple check their bookings! Hey, so glad you guys found them helpful and enjoyed Colombia. How strange that people were losing your bookings – I have never had that ever. How were you booking your rooms out of curiosity? We wish we could have visited San Gil, it came highly recommended to us, but we just ran out of time due to the poisoning incident in Santa Marta. San Gil, Colombia! White water rafting, waterfall rappelling, cave diving for very cheap! If you make it to Leticia, Colombia, you can take a boat ride down the Amazon to Iquitos, Peru. it’s only accessible by plane or boat. You overuse the word “amazing.” Try diversifying your adjectives.